A new urban initiative and small-business incubator called popuphood could revitalize Old Oakland. Opening a brick-and-mortar retail space can be a gamble for any business owner, especially in a sagging economy and in an area lacking other established retailers. That could partially explain why Old Oakland — the historic Downtown Oakland retail and business district comprising a cluster of distinctive late-19th-century buildings — has had a relatively lackluster retail presence over the past decade in spite of an influx of new bars and restaurants in the area. 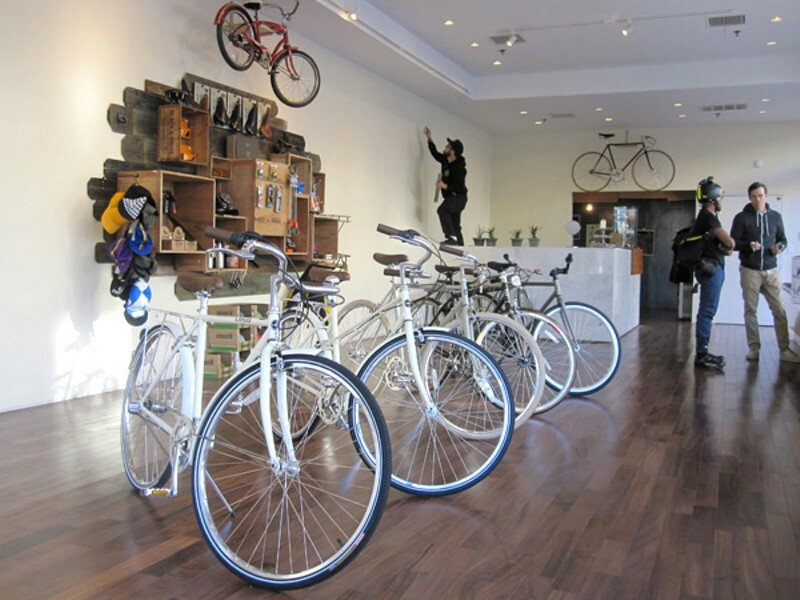 It also explains why the owners of Manifesto Bicycles in North Oakland didn't initially consider the neighborhood when they started thinking about opening a second location to showcase their custom-built bicycles. That was before Alfonso Dominguez, co-owner of the Tamarindo restaurant and tequila bar in Old Oakland, approached the owners with an offer they couldn't refuse: a spacious corner storefront with large, showroom-style windows and, what's more, six months free rent. "We didn't even have to think about it," said Manifesto co-owner Sam Cunningham, who runs the business with his wife, MacKay Gibbs. "It was pretty much instantaneous." After signing a lease in November, the new store (831 Broadway) is already up and running — and the owners are banking on more than just a gracious half-year rent waiver to stay afloat. Theirs is one of five new retail shops opening in five previously vacant storefronts centered at 9th and Washington streets at Broadway as part of a new urban initiative and small-business incubator project known as popuphood, launched three months ago by Dominguez and fellow entrepreneur Sarah Filley. What started as a rather informal and unconventional business plan is soon to become a very real retail boom. In addition to receiving $25,000 in seed money from Oakland's Tenant Improvement Program, Dominguez and Filley were able to negotiate a rent waiver with Peter Sullivan Associates, the owner of two buildings on the street with a handful of vacant storefronts essentially collecting dust. Dominguez, who saw a need for nearby retail to boost his own business, and Filley, who's worked on urban innovation projects in San Francisco, saw the symbiotic potential of an arrangement that gave proprietors time to set up shop without the initial costly overhead. "Negotiating six months free rent is quite a boon for all of them," Filley said. "It allows them enough time to get established, invest in the location, and leverage their existing client bases."